“El buen karma es aquel que te lleva más cerca de Dios, y mal karma es aquel que te lleva más lejos de Él.” Swami Kriyananda una vez dio esta respuesta frente a la pregunta de un joven. Su respuesta nos solo aclara mucha de la confusión que hay alrededor del tema del karma, sino que también nos da una directriz para vivir: Siempre esforzarse para hacer aquello que te lleva más cerca de Dios. 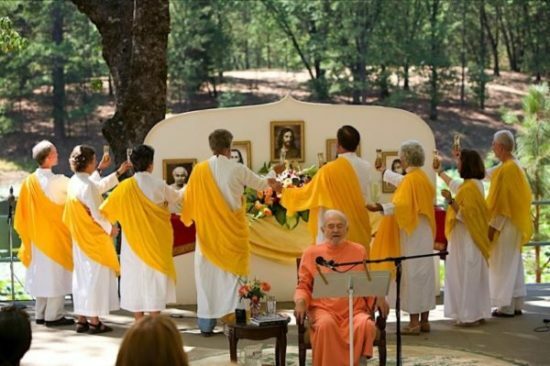 En otro momento Swamiji dijo, “Todo el sendero espiritual tiene como propósito disolver el ego.” Por eso, el buen karma es eso que disuelve el ego, y mal karma es lo que lo refuerza. Paramhansa Yogananda explicó que el pensamiento es una fuerza similar al magnetismo. Cada pensamiento, palabra o acción, emite un pulso de energía que atrae hacia nosotros una energía similar, como una piedra arrojada a un estanque crea una ola que rebota de vuelta hacia el punto de origen. Las acciones que están en sintonía con la ley universal atraen una respuesta kármica positiva, y aquellas que están en contra de la verdad universal atraen una negativa. De esta forma, gradualmente aprendemos a distinguir lo que está bien de lo que está mal. Cometemos un grave error cuando pensamos que el propósito del karma es castigarnos. Su propósito es enseñarnos. Piensa en él como una IT (Inteligencia Todopoderosa) súper avanzada y benévola, que le da a cada individuo un plan de estudios exquisitamente personalizado basado en el desempeño pasado. Dado que el objetivo es que desarrollemos actitudes positivas, lo que nos sucede es mucho menos importante que en lo que nos convertimos al lidiar correctamente con nuestro karma. Algunas personas reaccionan a la palabra “Dios” porque Lo definen erróneamente. Puede ayudar si, en vez de “Dios,” pensamos en términos de una de Sus cualidades. Entonces, ¿una acción en particular expande tu amor? Si es así, ella produce buen karma porque Dios es amor. Funciona de la misma manera si la sustituimos por sabiduría, paz, o gozo. Entonces, ¿cómo vencemos al karma? No tratando de hacer que todo sea placentero. Algo de nuestro crecimiento espiritual más poderoso viene como resultado de las experiencias más desagradables. El cáncer, por ejemplo: Mucha gente me ha contado, (generalmente luego de que ha pasado un poco de tiempo) que el encuentro con el cáncer fue lo mejor que les ha pasado. Lo mismo puede decirse de la pérdida financiera, o el fallecimiento de un ser querido. Ninguna de estas experiencias es agradable, pero cada una puede ser un poderoso maestro espiritual. Para vencer al karma en su propio juego, necesitamos desarrollar las actitudes correctas antes de que llegue la prueba kármica. Si ya nos estamos moviendo en la dirección correcta, entonces nuestro karma simplemente nos dará un golpecito en la espalda y nos empujará con más rapidez hacia la libertad. La actitud correcta nos permite vencer incluso a la muerte; las incorrectas nos hacen acobardarnos incluso ante un resfrío común. Arati durante el festival de la Luz en Ananda Village. Esfuérzate, durante las muchas complejidades de la vida, para ofrecer tu ego a lo alto con calma aceptación y gozo, y podrás navegar sobre el mar del karma, ya sea que esté soleado y agradable u oscuro y tormentoso. If we are to think of God as Love, Peace or Joy, why do we need an overarching concept of a God at all? Why not just think of Love, Peace and Joy themselves? Diane, I too had a similar question as the word «God» brings up so much. One of my teachers calls it, «Ultimate Reality.» I found «consciousness» to work. Everything else being an attribute of, or a «spin off» of consciousness. You’ve both raised an excellent question, and an important one. The concept of God that many of us in the West were raised on is not very inspiring, or even very believable. And so it’s no wonder that so many people, if they survive that indoctrination with their natural spiritual aspiration intact, decide to pursue their spiritual search setting considerations of God to the side. The problem is not with God, though, but simply with our definitions of Him. What we need today is a truer understanding of God. The alternative—to “throw out the baby of God with the bathwater of those unsatisfactory definitions”—would be to do ourselves a great disservice. Attempts to “cut God down to size,” or to sweep Him from the stage entirely, do nothing to diminish Him, but much to diminish ourselves in our own eyes. For we are in actuality God’s children, and our destiny—“enjoyable beyond imagination of expectancy,” as Yogananda put it—is a glorious one: to be reunited with Him. The problem with using light, love, peace, or joy as a substitute for God is that we normally think of these as being unconscious forces. On the other hand, God is both conscious and loving toward all of His children. There is a reason why definitions that satisfied people for centuries no longer satisfy us. It is that we are living in a new age, characterized by an awareness of energy as the reality underlying matter: The effects of this shift in understanding are revolutionary: in science and technology, in religion, in everything. Yogananda came as a wayshower for the age. As part of that mission, he brought to both East and West a new understanding—appropriate to this age—of God and of our relationship to Him. Have you had the chance to read his Autobiography of a Yogi? If not, you have a wonderful adventure in store for you. The book is a delight to read from start to finish, and it expresses a conception of God, and our relationship with Him—or perhaps I should write “with Her,” because Yogananda worshiped God as the Divine Mother—that is so intimate, so sweet, that you may find yourself a different person by the time you finish reading it. when it’s really one whole. You raise a good point. Unfortunately, the English language—and most of the others I know of—simply doesn’t offer us a good alternative to «he» or «she.» What’s needed is some humanized version of the word, «it.» There actually is such a word—»ini» —in Bengali. Language is constantly changing: Let’s hope the day comes when English adds a word like that. This raises a good point: Even if English did offer us a word like «ini,» we might not want to use it when thinking of (or praying to) God. I’ll append for you below something I think you’ll find quite interesting that Yogananda had to say on this subject. «The first step,» replied the Master, «is not to imagine that He wants your definitions. He wants only your love. «Indeed, yes!» replied Sri Yogananda emphatically. «God’s love is already reflected in human relationships. His love, like the sunlight shining on countless pieces of glass, is reflected everywhere. «The Infinite is the Mother behind all human mothers, the true Father behind all human fathers. He is the ever-loyal Friend behind all earthly friends. He is the eternal Beloved behind all human loves. He is all things to all men, because, you see, the Lord is everything. «Through your parents He cares for you, supports you, and protects you. Through your friends He shows you that love is a free sharing, without any hint of compulsion. Through the beloved He helps one to find the selfless intensity of divine love. Through people’s children He helps them to understand love as something precious, as a thing to be protected from harmful influences and nourished with devotion. «Countless are the forms in which God comes to man. In each, He seeks to teach man something of His infinite nature. The lessons are there, for anyone whose heart is open to receive them. «Thus, it isn’t that the Lord wants you to deny your human nature. What He wants, rather, is for you to purify it: to expand whatever love you feel in your heart, and not to keep it locked up in ego-attachments. «For the devotee, it is natural therefore to worship God in some human aspect: as his Divine Mother, for example, or as his Heavenly Father. «I myself worship the Mother aspect, especially. For the Mother is closer than the Father. The Father aspect of God represents that part which is aloof from His creation. The Mother is creation itself. Even among mankind, the human father is more disposed than the mother to judge their erring children. The mother always forgives. «Pray, then, to the Divine Mother. Talk to Her like a child: ‘Divine Mother, naughty or good, I am Your own. You must release me from this delusion.’ The Mother ever responds with compassion when the devotee prays to Her sincerely in this way. «Of course, in the highest sense God is none of the forms in which people worship Him. But it is helpful to use human concepts as a means of deepening our devotion to Him. Another classic practical guideline, Jyotish—thanks! These words give so much confidence , reassurance and Joy in working out our Karma which is already reduced by practice of Kriya. Thank you so much for this. It is so very reassuring and makes karma not as scary as it was! I am very new to Ananda and am loving what I am hearing. Thanks so much, dear friend and guide!